This article is in response to the recent attempt to paint the Holi festival as a Dalit oppression issue. I am a researcher focusing on the trail of monotheism and the origin of this idea of a jealous god who is tormenting humanity since the time humans became homo sapiens or acquired the ability to think. I have started these studies since 2012. By 2015 I have identified Hiranyakashipu as one of the oldest recorded personality exhibiting the traits of a monotheist god. Holi is a spring festival celebrated in a warm climate when the temperature rises after winter in India. We all know it is the festival of colours or the festival of love. The festival signifies the victory of good over evil and a thanksgiving for a good harvest. It is a festive day to meet others, play and laugh, forget and forgive, and repair broken relationships. It lasts for a night and a day, starting on the evening of the Purnima (Full Moon day). The first evening is known as Holika Dahan (burning of Hiranyakashipu’s sister Holika). The following day as Rangwali Holi, Dhuleti, Dhulandi or Phagwah. 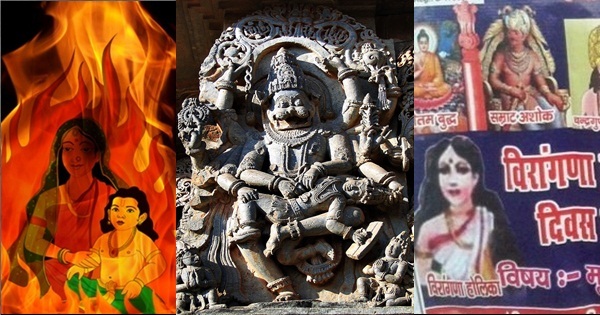 Who was Hiranyakashipu and Who was Holika? Hiranyakashipu was the Daitya king who thought himself to be the One and Only One God. (Daityas and Dānavās were cousins of the Āditya Devatas like Vivasvat, Indra, Mitra, Varuna and Vishnu). He ordered everyone to worship him and him alone. He killed and tortured everyone who worshipped other Gods and Goddesses. Some people were burned alive. Some others were thrown down from mountain heights like the modern ISIS terrorists did. Others were slain by sword and trident with their head severed or heart plucked. Hiranyakashipu did not even spare his own son Prahlāda, who was a worshipper of Aditya Devata Vishnu. He subjected Prahlāda to cruel punishments, none of which affected the boy or his resolve. Finally, at the behest of Hiranyakashipu, his sister Holika tricked him into sitting on a pyre with her in fire. Holika was wearing a cloak that made her immune to injury from fire, while Prahlāda was not. As the fire roared, the cloak flew from Holika and encased Prahlada, who survived while Holika burned. Vishnu then took the Avatara of Narasimha (half human and half lion) to restore Dharma, at dusk (neither day nor night), took Hiranyakashyapu at a doorstep (neither indoors nor outdoors), placed him on his lap (neither land, water or air) and then eviscerated and killed the king with his lion claws (neither a handheld weapon nor a launched weapon). The Daitya surname of Hiranyakashipu makes himself same as the authors of Avestan sacred texts like the Vendidād who lived on the banks of the Daityo river, identifiable with Vitastha (Jhelum river). Their book Vendidād (meaning in Avestan being ‘given against the Devatas / Daivas’ i.e the Vedic deities worshiped in Bhāratavarṣa) outlines a religion based on the hatred of the Āditya devatas like Indra who are demonized in their religion. This is humanities first religion based on visceral hatred towards another culture and their gods and goddesses. Severe punishments including death penalty is mentioned in Vendidād for anyone seen worshiping any of the Āditya devatas like Indra or Vishnu, much like how Hiranyakashipu is seen punishing the worshipers of Āditya devatas. Hence it is possible to identify the Avestan high god Ahura Mazda (Asura Medha / Asura Intellect / The Chief among the Asuras) with Hiranyakashipu. In the same way, the language of the Daityas is identified with the Avestan language, an Indo-European language, and a close cousin of Samskrt. It is much similar to Vedic Samskrit, with a lot of similarities in vocabulary, words and pronunciation but with marking differences like ‘s’ in Samskrit is pronounced as ‘h’ in Avestan. Thus, the words like Sindhu becomes Hindu or Hendu in Avestan, Asura becomes Ahura, Sarasvati becomes Harahvaiti and so on. Similarly, Ashva becomes Aspa and Aryaman becomes Airyama in Avestan. If mapped to modern times, the Daityas are the ancestors to modern Persians and their ancient Avestan religion transformed into Zoroastrianism. The Persians, speaking the Indo European languages, were in a long-lasting trade relationship with the Semites who lived to the west of Persian territories. The Semites, speaking Semitic languages like Arabic, Aramaic, etc. lived in Iraq, Arabia and as far west as Israel. The idea of a jealous god who cannot tolerate other gods and goddesses of other cultures spread to Semites and based on these thought-currents, a new religion Judaism was born among the Semites. The jealousy has become so acute that the jealous god cannot tolerate even other gods and goddesses belonging to the same culture. Thus, true monotheism was born starting with Judaism, whereas the monotheism of Zoroastrianism can be termed as quasi-monotheism, where other gods and goddesses (like Anahita etc) belonging to the same culture or pantheon was tolerated but with a lower status than the high god Ahura Mazda. The monotheist god of Judaism however could not tolerate goddesses like Ashera worshiped as the wife of Yahwe the monotheist god of Israelites. The worship of all other gods and goddesses in the Caananite pantheon from where the Judaism of Israel derived much ideas, were banned by the adherents of the new religion. Always a male god belonging to a captured culture is chosen as the One and Only one monotheist God to express the evil consciousness of Hiranyakashipu. Goddesses are always discarded along with all other male gods. After selecting the monotheist god (in case of Judaism, that god being Yahweh, usurped from the Caananite pantheon) worshipers of other gods and goddesses were murdered brutally. The visceral hatred of other cultures and their gods and goddesses which is inherited from Zoroastrianism continued and amplified further in Judaism. Subsequently Christianity was born from Judaism. Christianity, inspired by its One and Only one jealous god of the Bible destroyed many ancient polytheist cultures in Greece, Rome, whole of Europe including England, Norway, Sweden (this includes Greek, Roman, Celtic, Germanic, Nordic cultures, each of them vibrant and full of ancient wisdom). Then they colonized Africa, the Americas, Australia and New Zealand and destroyed all the ancient cultures there (this include the great Mayan, Aztec, Maori cultures). Thus, the reincarnation of Hiranyakashipu as the One and Only One jealous Abrahamic god of the Bible started controlling and torturing most part of humanity spread across most parts of the world. Due to the influence of Christianity and Judaism in Arabia, the polytheist tradition of Arabia was destroyed and the idea of One and Only One jealous god who hates other gods and goddesses became rooted in Arabia. As a result of this, the whole Arabian Peninsula was Abrahamized. Allah, the high god of the polytheist Arabs was chosen as the monotheist god for the Arabs and worship of other gods and goddesses in the Arabian pantheon viz. Allat, Al-Ussa, Manat, Hubal, Shams etc were banned and their worshippers brutally murdered. The Arabian Abrahamics became the most virulent proponents of the hatred and iconoclasm originally exhibited by Hiranyakashipu and destroyed many ancient cultures including Egyptian, Levantine, Mesopotamian and Persian. Finally, they arrived in Bhāratavarsha, and caused much damage to the temples and universities of Bhāratiya culture. From 800 CE to 1600 CE what Islamic armies did to the temples, devatas and devata worshipers of Bhārata is a repeat of what Hiranyakashipu has done to the devatas and devata worshipers in Bhārata during his reign. The Islamic State which originated in Iraq and Syria too was the re emergence of the evil consciousness of Hiranyakashipu. Exhibiting his terrible teeth, fierce glance and frowning eyebrows, terrible to see, he took up his weapon, a trident, and thus began speaking to his associates, the assembled Dānavās. Real Holikaa Dahan happens in the mind. In Holika Dhahan, we burn the Holika and make Prahlāda live and not the other way around. Hiranyakashipu represents our ego, our adamant attitudes, anger, hatred, jealousy and the tendency to exclude and isolate others, causing them pain and suffering. Holika , the sister of Hiranyakashipu represents our evil thoughts, the urge to fight, the thoughts of jealousy, anger, deceit etc. She represents our evil past. Child Prahlāda , the noble son of Hiranyakashipu represents our future, our growing unity and harmony and our noble thoughts of forgiveness & friendships. In Holika Dhahan, we burn the Holika, our evil past and allow the boy Prahlāda to live, signifying the growth of the infantile seed of our united future, giving rise to unity and harmony. Hence, burn Holika, not Prahlāda.